Jackfruit (Artocarpus heterophyllus), is also known as nangka, langka, jack tree, fenne, jakfruit, or sometimes simply jaca, jack or jak. This much storied fruit recently hailed as the next ‘miracle food’, is a nutritious food you should try to eat often, if you can get your hands on it. It grows exclusively in the tropics and is somewhat hard to find this fresh fruit in other parts of the world, but not impossible. To those living in Western countries, jackfruit may be a thing of wonder. The whole mature fruit is massive, and it is the largest tree-borne fruit. Although its average weight is about 10 to 25 pounds, it can easily grow up to 35kg (80lbs) and far larger than a big watermelon! Jackfruit has a distinctive sweet and fruity aroma that lingers in the room long after it is consumed. The inside of the fruit houses hundreds of arils that have edible seeds (that need to be boiled/roasted). This sweet fruit is described as smelling of a combination of pineapple and banana and the texture is chewy. 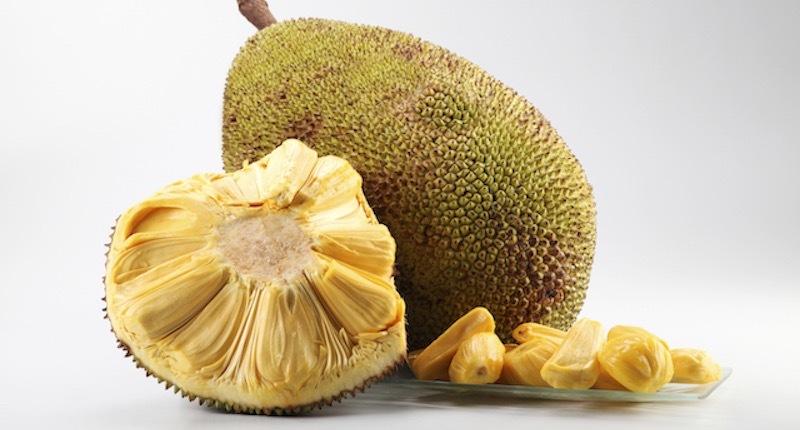 Are Jackfruit and Durian The Same, Or From the Same Family? Not to be mistaken with durian, both fruits look similar but are completely different fruits. They are not even related. Both fruits have a thorny appearance, emit strong aromas and are delicious to the locals. One easy way of telling durian apart from jackfruit by their appearance, is that durian (which means “thorns”) thorns are pointed and sharp. It is difficult to hold a durian with your bare hands without getting “poked” (unless you’re an expert with durians!). Jackfruit is a far larger fruit and the “thorns” are smaller and “blunt”. Both have distinct, strong aromas that are different and may be repelling to foreigners who are unfamiliar with the smell. To the locals, these fruits are heavenly! This giant fruit is rich in a wide variety of phytonutrients, isoflavones, lignans and saponins that are powerful antioxidants with anti-cancer properties. In terms of nutritional value, jackfruit is chocked-full of protein, minerals and certain vitamins. Most of these nutrients are available in the ripe and unripe flesh of the fruit. Even the edible seeds are nutritious when cooked. The flesh of jackfruit is very high in riboflavin. The raw fruit is rich in vitamin C, vitamin A, and vitamin B6. It is also a good source of the minerals: iron, zinc, sodium, folate, manganese, magnesium, potassium, and copper. If you are trying to lose weight, a serving of ripe jackfruit is a guilt-free dessert. Each serving has full dietary fiber, while being low in sugar and fat. A cup of jackfruit contains only 155 calories. Anti-cancer: Jackfruit is rich in various phytonutrients that fight free radicals in the body and help prevent cancer and many diseases. According to studies, phytonutrients bind to receptors in the same way estrogens do, and significantly reduce the risk of certain cancers. Antioxidants: Antioxidants are substances that protect cells from oxygen radicals, which destroy cell components. Phenols and flavonoids (forms of antioxidants), are concentrated on the flesh of the fruit—they help lower inflammation in the body. Anemia: Anemia is an issue of low iron levels in the blood. Iron is needed to produce hemoglobin, the component of red blood cells responsible for carrying oxygen and nutrients throughout the body. People with anemia often feel incredibly tired throughout the day, even with adequate rest. Anemia also causes shortness of breath, poor concentration, and palpitations. Blood sugar levels, balance: Among fruits, jackfruit is highest in water and dietary fiber content. It is also very low in fats, sugars (despite its sweet taste) and starch. This means that jackfruit is very beneficial in maintaining stable blood sugar levels. You probably have blood sugar imbalance if you are overweight, have metabolic syndrome, or pre-diabetes. In that case, eating fresh jackfruit may help . Bone health: Jackfruit is rich in minerals including calcium and phosphorus, which are needed for bone strength. Your bones need a lot of calcium and phosphorus to repair and maintain bone strength. You probably need more of these minerals if you have osteoporosis or in their 40’s. Constipation: Constipation is often caused by lack of dietary fiber in the diet. If you often feel uneasy, try eating at least two servings of jackfruit per day. That will give you around 6 grams of dietary fiber, which will help ease constipation and promote healthy digestion. DNA protection: The presence of folate in jackfruit protects your DNA from oxidative damage. Energy: If you have problems with fatigue, try eating jackfruit. Jackfruit is very high in vitamin b6 or pyridoxine. Pyridoxine is important for proper energy production and it helps the nerves perform at their best. Eye health: Jackfruit has high vitamin A and beta-carotene content that makes it a healthy fruit to be included in your diet to improve eye sight. It helps protect against development of cataracts and other eye problems. Heart healthy: Your heart health will benefit from regular consumption of jackfruit. The flesh of the fruit has virtually no fat. Also, its hefty dietary fiber content (2.6 grams for every one cup serving) can help reduce oxidation of cholesterol and lower triglyceride levels. Immune system: Like any other fruit, eating jackfruit helps to supply your body with a wide variety of nutrients. It is especially high in vitamin C content that acts as an antioxidant to protect your body from oxidative stress. The polysaccharides content in jackfruit help improve and strengthen the immune system. Magnesium and Potassium boost: Thanks to its high magnesium and potassium content, eating jackfruit provides this mineral for preventing leg and muscle cramps. As magnesium is needed for over 300 bodily enzymatic functions, this mineral is welcome to prevent deficiency and improve overall health. 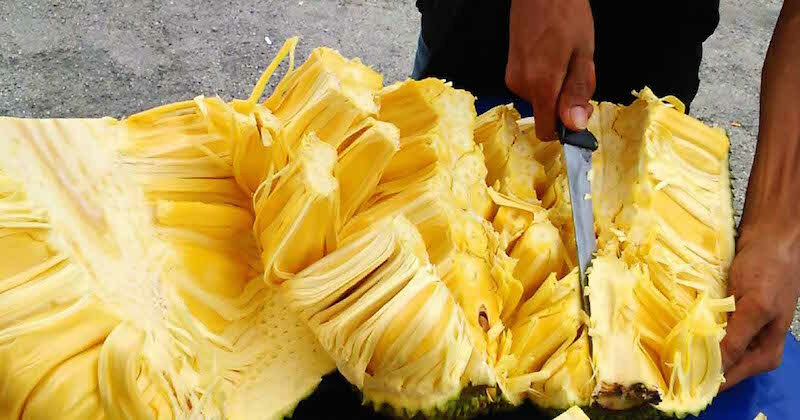 You might probably find fresh jackfruit in pre-packaged packs in Asian markets. 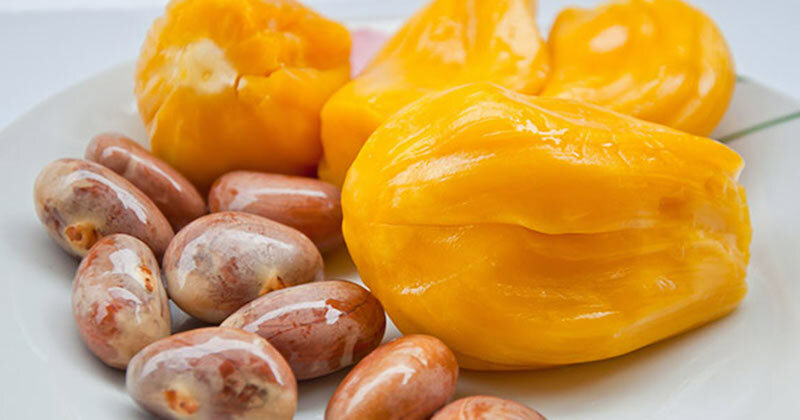 Ripe jackfruit is often eaten uncooked to benefit from its rich nutrients. Unripe jackfruit is often canned with brine for export, or cooked with coconut milk or added into curries. Ripe jackfruit has a strong fragrant that lingers. Many people find its sweet taste and appealing aroma delicious. It can also be cooked in syrup as a nice topping to vanilla ice cream and sweet baked goods. Jackfruit is safe to eat. Allergies to jackfruit is very rare and almost unheard of. Buying the whole fruit—which is very large, can easily feed a small village! The fruit has a thick green rind with thorny appearance on the exterior. On the inside, it has hundreds of large arils surrounded with juicy stringy pulp. Note that the fruit has sticky sap, so slicing and preparing the fruit often results in a sticky mess. Fresh ripe jackfruit is often eaten whole and I don’t recommend juicing it. The large jackfruit seeds must be roasted or boiled before being eaten, much like the avocado seeds.